Police continue to comb through a Hyattsville, Md., neighborhood, searching for a man who sexually assaulted two women and robbed several other individuals Tuesday afternoon. Two women in their 20s walked out of an apartment in the 6700 block of Belcrest Road in Hyattsville about 1:30 p.m. Tuesday and were approached by a man with a gun, Prince George's County police said. "What occurred here [Tuesday] afternoon is highly unusual," Julie Parker with Prince George's County Police said. "We can't think of something that we've seen like this in any recent time." Prince George's County Police launched a search helicopter and K-9 units Tuesday in their effort to catch the suspect. As of Wednesday night, the suspect was still on the lam, while officers knocked on dozens of doors in the neighborhood. For precautionary measures, nearby Northwestern High School was locked down while police searched for the suspect. 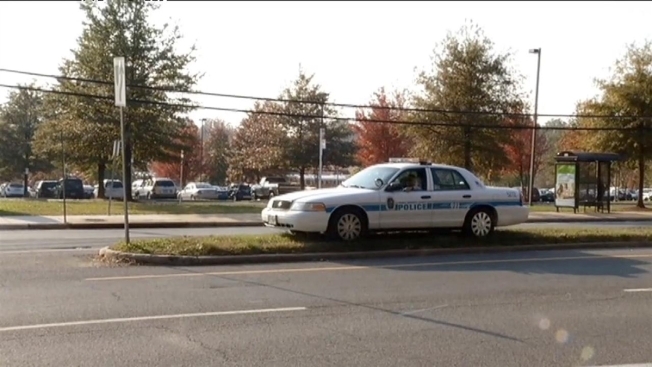 Students were released from the school just after 4 p.m.
News4's Shomari Stone has the latest details in a manhunt for a suspect wanted for sexually assaulting two women and robbing several other individuals Tuesday afternoon in Hyattsville, Md. Northwestern’s principal sent a letter to parents Wednesday informing them of what happened. “The safety of our students – both in school and in the community – is of the utmost importance," it said. "We will be working with security staff to ensure the safety of the students while in school and will be sharing safety messages with students to encourage them to be safe while walking to and from school." Shomari Stone gives a live update on the search for a man who robbed several people at gunpoint and sexually assaulted two women in Hyattsville, Md. Police have launched a massive search for the man near Northwestern High School.